Danielle began teaching at Covenant in 2017. She is the Pre-K teacher and also serves as a Kindergarten Aide. 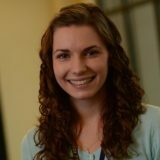 She attended Messiah College with a major in Elementary and Special Education. She enjoys baking, traveling, and spending time with family and friends. She attends Covenant Orthodox Presbyterian Church.